Teak shingles has all of the attributes one could wish for in a roofing shingle, and its secret lies in its tight grain and natural oils. Basically, Teak Shingles has a naturally high Silica content, which gives it a unique ability to withstand the elements, and it actually repels water. Choose between vintage building salvage from Southeast Asia, or new Burmese teak. Colors range from muted gold, coppers and tans with rich brown and silver-gray grain highlights. We also provide tapered starter shingles, hip shingles and ridge shingles. What Are Teak Shingles and Shakes? Custom teak shingles and shakes are sometimes mistaken for one another. While they are incredibly similar in their attributes, there are slight differences that you should understand before making a decision. Shingles are typically sawn on both sides, which gives them a smoother and more refined finish and feel. Specialty teak shakes are just slightly different in that they are sawn on one side but split on the other. That means the split side, which faces outward, has a more rustic look and feel to it, which is perfect for many homes. You can find shakes and shingles in all sorts of materials. But, as mentioned, teak is unique for several reasons, and it provides a wide range of benefits that you simply won't get from other roofing materials. First of all, along with wallaba, teak is just about the most durable material that we use in creating shakes and shingles. Cedar is known to last far longer than more traditional roofing solutions — up to 30 years. But properly installed teak shakes and shingles can last 50 to 80 years, which means incredible value and a huge return on your investment. What helps specialty teak shingles last so long? The wood comes from Asian mint trees, which are naturally resistant to both mold and water. There’s little risk of moisture damage or mold and mildew damage. This isn’t the case with traditional roofing materials that are constantly threatened by moisture, and it’s not even the case for premium cedar shakes and shingles, which need additional treatment to prevent the emergence of mold, mildew or moss. What Benefits Does Teak Offer? But the benefits of decorative teak shingles extend beyond just durability. As mentioned, you get versatility in appearance. You can choose from a number of different options, both in color and in shape. Most of our clients choose either tapered or ridge shapes, and they often choose for either a gold or gray color. Each of these options is a good choice, though the best one for you will be the one that complements your home’s existing architecture. In addition to the durability of teak shingles and shakes, they also require little maintenance. This is mostly due to its natural moisture- and mold-fighting qualities. While other premium roofing materials are also durable, they do require regular maintenance. When you choose teak shakes and shingles, you get durability with a fraction of the maintenance needs. Not only do custom teak shakes prevent moisture and mold from setting in, but they also maintain their size and shape even through extreme weather. When it's incredibly hot or incredibly cold outside, wood shakes and shingles typically expand and contract with the temperature, which can cause problems over time. That is not the case with teak. There's no deterioration and no shrinkage to worry about. Finally, decorative teak shakes are also an eco-friendly roofing option. It’s natural, which means the manufacturing process behind teak shakes and shingles isn’t taxing on the environment. And, because it lasts for so many decades, it provides value and eliminates waste. There is a minimum order requirement for some of our products. For curved Cedar shingle orders, the minimum quantity requirement is just one (1) box. For Fancy-Cutt shingles, the minimum order is five (5) boxes. Depending upon current inventory, our minimum order for Wallaba is generally 2,500 SF and Teak shingles, 1,000 SF. Please contact us for additional details. Almost everything about custom teak shingles and shakes is unique. Teak is rarely grown in the United States, which may be one of the reasons it’s so rarely found on American roofs. The other reason, though, is that few roofing professionals have the experience and knowledge needed to properly install a roof made of teak wood. Teak trees grow to be incredibly tall — over 100 feet and closer to 150 feet in most cases. They also live long lives of 100 years or more. They are mostly located in Asia, where they hone their strength over time while existing in humid climates and fighting monsoons. Because of where they are grown and how they grow over time, teak trees have innate qualities that lend themselves nicely to use as a roofing material. And the results are dramatic when the right home is paired with the right teak shingles or shakes — and the right custom wood roofing service provider. Exotic teak shingles and shakes are found on homes of many different kinds. Teak shingles and shakes work on such a diverse collection of housing styles because they can be cut and curved in so many different ways. Specialty teak shingles and shakes look most appropriate on historic homes that feature high-pitched roofs or curved roofs. You can see in our portfolio many different examples of decorative teak shingles and shakes in action. 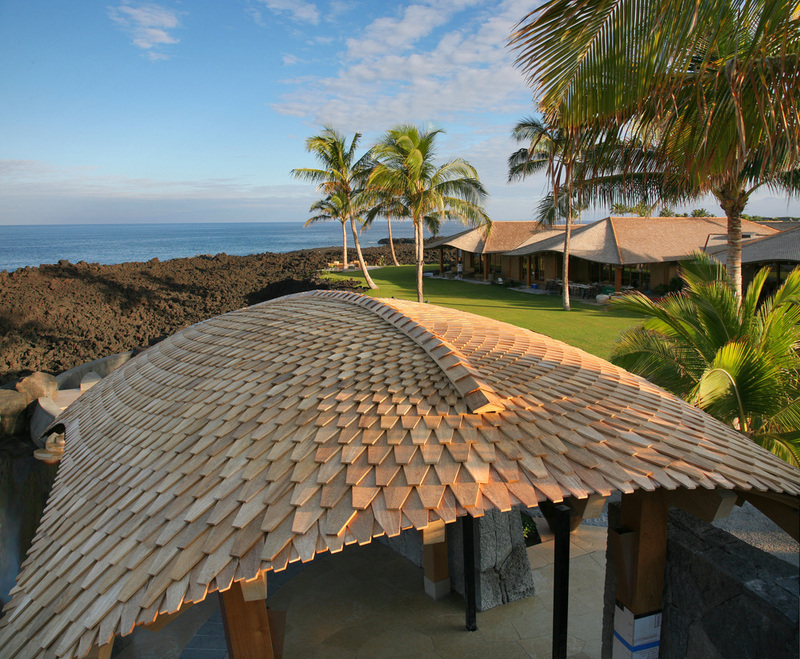 Even outdoor canopies with undulating shapes can look fantastic with the right teak shingles. At Custom Shingles, we offer a number of custom wood roofing and siding solutions — but we also offer guidance every step of the way. We can provide free estimates, design consultations and existing roof assessments before work begins. These services help ensure you’re getting exactly what you’ve always wanted in a custom wood roof. Use our portfolio section to generate ideas. You may find there’s a picture of a roof that matches what you’ve always envisioned for your own home. Or, you may find that one of the photos gives you a unique and interesting vision that we can help see through to reality. Matching a home to the perfect custom wood, whether teak or otherwise, should be a process of careful consideration. We can help you through that process, providing support, information and guidance at every turn. In addition, we can also help replace historic teak shingles. Expect professionalism and quality when you choose Custom Shingles as your provider of teak roofing solutions. As noted above, teak is a rare roofing material and very few traditional service providers can provide proper preparation and installation of teak shingles and shakes. At Custom Shingles, we are the premier installer of custom wood shakes and shingles because we’ve perfected the tools and processes need to create outstanding results for our clients. We see what we do as an art form, and we see your home as not just another job but rather as an opportunity to create a work of art. A properly installed teak roof commands attention and is striking in its beauty. Creating that type of outcome is difficult without proper installation by professionals. At Custom Shingles, we pour all of our knowledge and experience into each home we work on and we emphasize care and attention to detail at every step. We see your home as a beautiful and historic asset that’s been entrusted to us and we go about our work in a way that respects that responsibility and strives to create perfection. Whether you need to install or replace historic teak shakes, we’re here and available to volunteer our experience, knowledge and guidance in order to ensure you achieve the best possible results for your home. Since 1982, we have been providing custom wood roof and siding solutions to owners of historic homes. Through our more than 35 years of service, we’ve perfected an array of resources and tools and we’ve developed the necessary knowledge and experience to deliver outstanding results. Whether you’re interested in teak shakes and shingles or another premium custom wood roofing or siding material, you won’t find a team that’s better equipped or positioned to do the job the right way. As noted above, we approach our work as an art form rather than just a trade. Teak and other premium roofing shakes and shingles are unique and provide distinct challenges during installation. To create the desired results, the installer must be intimately familiar with using teak shakes and shingles, and must also be skilled at translating complex roofing plans. We’ve found through the years that few roofing professionals can competently install teak shakes and shingles, much less exceed expectations with the results they create. We are a resource to you as you consider teak shakes and shingles and other premium roofing and siding products. If you need a free quote, or if you simply have questions, we're glad to speak with you and to share more about the possibilities for your home. More than anything, we want to ensure that the look and feel you've always wanted for your home can become a reality through the installation of a teak shake or shingle roof. Are you ready to explore the possibility of teak shakes or shingles for your home? Getting started is simple and easy. Just fill out the quote request form below and we’ll be in touch quickly with an estimate for your home. And, as mentioned, we can answer questions, make recommendations and provide general guidance as you consider your custom wood roofing options. Fill out the same form if you need to replace historic teak shingles and shakes.